According to data from U.S. Customs and Border Protection, more than $13 billion in duties imposed by the Trump administration were assessed on imported goods as of Dec. 18. 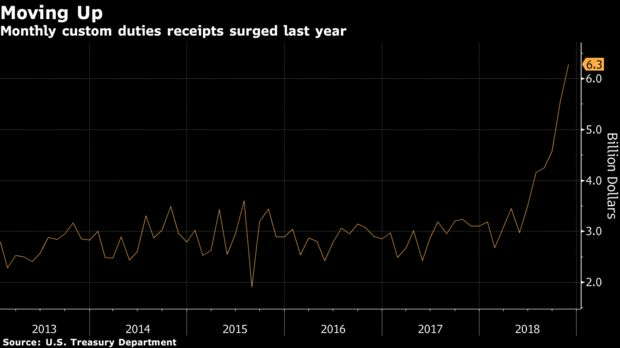 Actual collections could lag and be lower because of refunds and other factors, but Treasury Department reports show receipts from all customs duties have risen sharply since the tariffs took effect. While Trump has suggested on Twitter and in public comments that tariffs are somehow being charged to or paid by China and other countries, trade economists say that’s generally misleading. U.S. importers of record are responsible for the duties, and ultimately U.S. businesses and consumers could pay through higher costs, they say. “Tariffs on Chinese imports are paid by Americans, not by the Chinese or their government. The President’s tariffs are simply a #tax on American consumers,’’ Hanke said on Twitter Jan. 6. Hanke also pointed out that there are offsets to increased revenue from Trump’s tariffs, including as much as $12 billion in aid being paid to farmers after China slapped retaliatory tariffs on U.S. agricultural products. The White House didn’t respond to messages seeking comment. Trump has said any economic pain from tariffs or retaliatory duties imposed by other countries will be outweighed by the long-term benefits from new trade deals. The Trump administration imposed tariffs starting last January on foreign-made solar equipment and washing machines, then levied duties on steel and aluminum imports from March on the grounds of national security. He has slapped duties on about $250 billion in Chinese goods in response to a trade deficit and allegations of intellectual property theft and other unfair trade practices. Customs and Border Protection collects the tariffs based on the price paid for shipments and the tariff rate in effect, and duties are charged when shipments are released into the U.S. The assessed amount now tops $13 billion, with $8 billion coming from the duties on Chinese goods, data provided by CBP show. The duties are deposited in the U.S. Treasury. Customs duties increased by $8 billion in the final three months of 2018, an 83 percent gain from the year-ago period thanks in large part to tariffs imposed by Trump, according to estimates from the non-partisan Congressional Budget Office. It’s not foreign governments paying, said Dan Anthony, vice president of The Trade Partnership, an economic consulting firm. U.S. businesses paid $2.8 billion in new Trump tariffs in October alone, The Trade Partnership determined in an analysis for Tariffs Hurt the Heartland, a coalition of business and agricultural groups lobbying against Trump’s duties. Companies aren’t equivocating about the cost. Ford Motor Co. executives, speaking during the Deutsche Bank Global Automotive Conference in Detroit on Wednesday, said they see a $700 million headwind from duties this year. General Motors Co. said late last year that tariffs on steel and aluminum had already cost it $1 billion. “Let me be very clear: Tariffs are taxes paid by American families and American businesses -- not by foreigners,’’ Thomas Donohue, president of the U.S. Chamber of Commerce, said in his annual state of American business address last week.